Orang-utans are one of the world's most fascinating creatures living primarily among the trees. They're the only mammal apart from us that habitually walks on two legs. Sue Nelson from the Planet Earth podcast visited Birmingham University's posture and balance lab to meet a team who are researching the way that humans, and by extension our shared ancestors with orang-utans, moved around. She spoke Project Director, Dr. Susannah Thorpe. Susannah Thorpe - We're really interested in human evolution and one of the most important things is how human ancestors started to walk on two legs. Our idea is that this began in the trees. So what we've created here is the kind of environment that our early ancestors would've experienced when they were walking on two legs and trying to balance on the edges of trees as they're trying to reach for fruits or cross gaps in the canopy. Sue Nelson - You say our common ancestors. We haven't got any of those present, so what do you use instead? Susannah - We're using humans to try and understand what our ancestors did, but we're also using orang-utans. And this is on the basis that we think the origins of bipedalism lie in our ancestors moving around in the canopy of tropical forests. 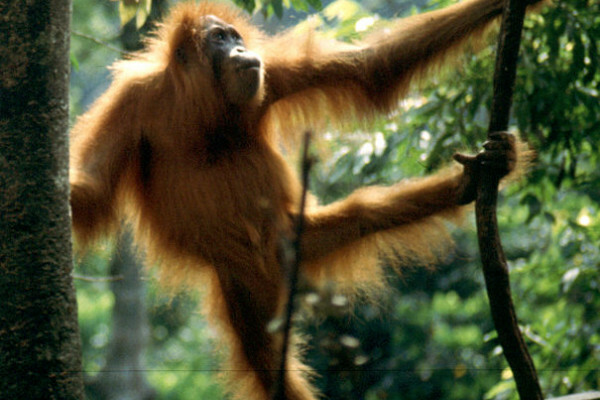 Orang-utans are the only one of the great apes which are our closest living relatives to still live in that habitat. So they're a perfect model to understand the problems that our ancestors would've faced. Sue - What role is Emma, who's a doctor or researcher going to play here - not that of an orang-utan, or is she? Susannah - Emma is going to be our guinea pig today and she's going to walk on the beam and well hopefully, she's going to be able to balance on it without falling off. Sue - Emma is also with Dr. Sam Coward. Sam, you designed this equipment here. What are you going to do to Emma in order to examine how she actually walks across this recreated forest branch? Sam Coward - Well we have a number of cameras in this room which attract reflective markers that we placed on the subject. This technology is commonly used in film making, so it's a sort of technology that's used in the making of Gollum. Sue - In Lord of the Rings? Sam - That's correct. To get enough information to fully recreate full body movements, we have to put somewhere in the region of 70 markers on the subject. Sue - Emma is now kitted up. Could you explain Susannah what Emma is going to be doing for us here? Susannah - You can see that the beam, we have one fixed end and one free end, and obviously, it's much harder moving on the free end because it's more flexible, so it's going to bend more under her mass - under her weight. Sue - Which is how a branch and a tree would be. Susannah - Yes, and she's going to walk slowly along towards the end of the beam, and if she feels like she might fall off, she's going to use the thinner hand beam to help balance herself. Emma - Well I'm starting at the unfixed end and this is the most flexible end, so the most unstable. So it's getting a little bit easier as I'm walking towards the fixed end, but am still having to use the hand beam to balance. Sue - How does it feel compared to how you normally walk? Emma - A lot more unstable. You're kind of wanting to grip with your feet. I just suppose it's similar to what an orang-utan would do in the canopy and this is on the thickest beam, so I dread to think how I'll fare on the narrower ones! Susannah - We're trying to get information on all aspects of this movement, both from the perspective of the person moving on the branch and from the perspective of the branch itself. So, the beam is instrumented which means that we can record the forces that the person is exerting on them as they walk. On Emma, we have all these reflective markers and the cameras are picking those up so that we have a very detailed 3D movement of her body and all of the separate limbs. Coupled with that, we have an EMG system attached to her muscles as well which are these sticky plasters that record muscle activity. And finally, we also have an ultrasound attached to her muscles, and these tell us how much the tendon is moving and how much the muscle fibres are moving themselves. The final part of the program is to play on this screen, images of branches moving in the wind and this is to try and destabilise her a bit more, make it much more realistic for how it would be for one of our earliest ancestors to move in the arboreal canopy where the branches are all moving and which must knock their balance. Sue - What do you hope to gain from this research? Susannah - We hope to gain two things really: One is, a better understanding of how orang-utans move in their habitat and how costly it is because logging and deforestation is devastating their habitat, and if we can understand their crucial habitat requirements, we can gain a lot of knowledge about where they can be reintroduced and so forth. Our second primary outcome of this project is to understand about our own evolution; to work out why bipedalism evolved, what the benefits were in our early ancestors, and how well adapted our ancestors were to walking on two legs before they came down to the ground.